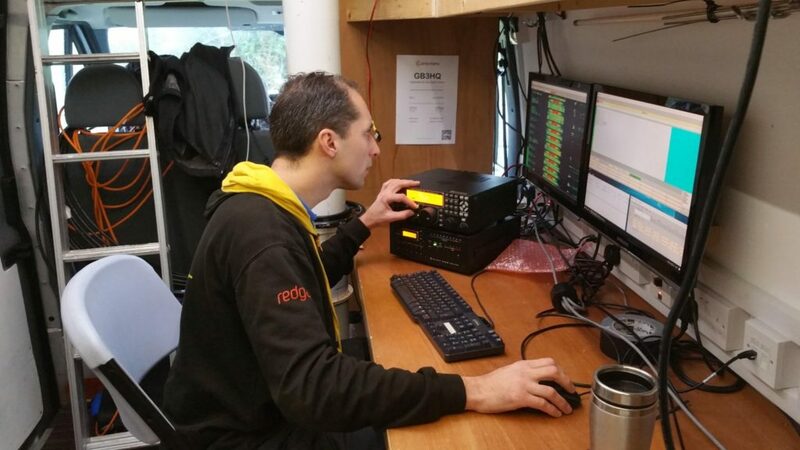 I operated with Rob M0VFC for the three RSGB 80m and 40m Affiliated Society Contests in January 2018 from Flossie, the Camb-Hams van, at our Worts Causeway site (JO02CE). This was a very fun event. We were using two Elecraft K3s, one with a KPA500, and the other with a Juma amplifier, to dipoles. The 80m dipole was at the top of Flossie’s mast, and the 40m was parallel with the centre about halfway up the mast. Despite this, there were no discernible interactions between the antennas. We were about 20 minutes late on, just by virtue of having been late on-site, but we were still able to take advantage of about 40 minutes good inter-UK propagation on 40m before changing to 80m. Once we were underway properly running on 80m, we then started interleaving S&P QSOs on 40m, using a simple interlock cable on the K3s to keep us abiding by the rule only to transmit on one band at a time. (The running station was master, and could transmit at any time; the S&P station was slave, and could only transmit when the master was not in transmit). It did take us a little while to get used to watching each other to avoid transmissions being interrupted by the interlock, but it netted us a nice few GMs and EU stations while allowing the 80m station to keep the run frequency. Thanks to M0PCB’s fantastically quick adjudication, we now know that we came joint 28th overall, with 230 points. This put our entry into the Camb-Hams B team, which came 7th overall (with Camb-Hams A coming first). We had double the average amount of errors for the contest in our UBN, so that’s something to work on for next year! We were late on again for SSB – this time due to multiple failures of the 80m dipole – which meant that we missed the fact that lots of people gave up on 40m early because of conditions and the QRM from the Italian contest. This, in turn, meant that we were late getting down to 80m. Once we were running, though, we got some good rates. We again interlocked the two K3s, and this was much easier on SSB as we could hear what each other were doing, of course. At times, it was even slow enough for us to operate 2O2R3V (two operators, two radios, three VFOs!) as the running operator could S&P on the B VFO in-band, as well as CQing! We got a score of 228 points, giving us 22nd place overall. This again put us in Camb-Hams B team, which came fourth overall. Again, we were pleased that Camb-Hams A were first. The inclusion of datamodes in AFS this year is new, and it gave us our first experience of a datamodes contest. I’d only briefly dabbled before, and Rob had never touched RTTY or PSK. Despite another failure of the 80m dipole, we were set up on time. The start was very slow, however, and for a while we thought something was wrong. However much we called on 40m, nobody came back to us. Some S&P proved that there was nothing amiss, though, and returning to running, everything suddenly came to life. This time we didn’t operate with two radios: we weren’t experienced enough for that. We did however use the second K3 to monitor our transmitted signal with no antenna connected, thus giving us confidence that we were ‘clean’. At time of writing, we haven’t got adjudicated results yet, but our claimed score is 171. This looks to be a pretty good score. Most interesting is that the highest scores in both the 100W and 400W categories look very similar, and the fact that 172 is much less than the ~230 points we got in the other two legs. This seems to confirm our suspicion at the time that the contest was activity limited, rather than limited by conditions or equipment. If so, that could do very interesting things to the wider AFS Superleague results. Update: The results are now out and, amazingly for our first data contest, we got a completely faultless log. As such, we placed in the Camb-Hams ‘A’ team, which came second to Norfolk ARC ‘A’.